The District Award of Merit is a council award presented by districts in the same manner that the Silver Beaver is a national award presented by councils. The award is available to Scouters who render service of an outstanding nature at the district level. The award is made available annually on the basis of 1 for each 25 traditional units or fraction thereof. To nominate someone for the District Award of Merit, click the button and complete the form. 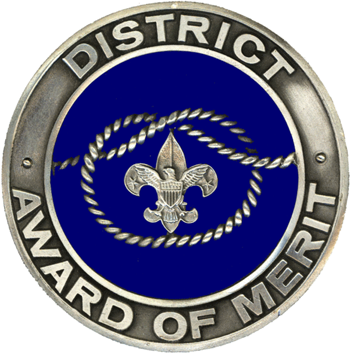 The following list represents all of the Scouters who have received the District Award of Merit throughout the district's long history. While the Golden Eagle District formally began in 2016, it's history dates back much further. Please complete the information below to nominate someone for the District Award of Merit only. Nominees will only be considered for the awards for which they have been nominated.